Watauga County is something of a bellwether county. Whoever wins Watauga tends to win statewide. This is because the county is pretty much a microcosm of the state at large. Its county seat, Boone, is a liberal college town which contains Appalachian State University. The outlying areas are much more rural – and Republican. Not surprisingly, Democrats tend to do better when students turn out. In 2008, youth turnout and enthusiasm for Barack Obama was huge, and he rode that enthusiasm to a countywide win. That turned out to be the high water mark for Democrats. In 2010, Democrats and young people stayed home, and Republicans turned out in droves. The result? A solid 55-42 win for Senator Burr in Watauga County. Democrats can win in Watauga County. But they need high youth turnout and a favorable national environment. In 2008, Democrats had both of those factors. In 2010, they had none. And in 2012, Democrats were winning nationally but youth turnout was down. And Republicans did much better at turning out their own young people – the ASU College Republicans were particularly effective at recruiting new voters in the county. This resulted in a 50-47 victory for Mitt Romney. Thus, Watauga is almost, but not quite, a bellwether. In a tied national race, it should be expected to go for Republicans. Boone is neither liberal enough nor large enough to guarantee victory for the Democrats here, unlike in other counties containing large colleges. Prognosis: Watauga County posted a strong growth rate of 19.64%. Most of this growth came from the town of Boone, which is good for Democrats. 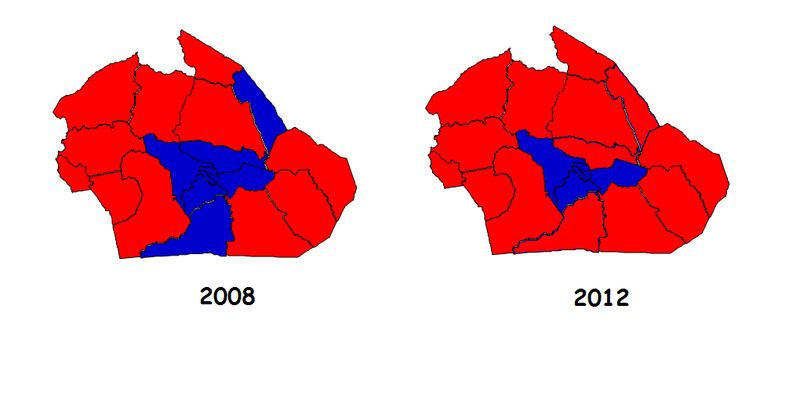 Watauga County trended to the right in 2012, but it’s still not as Republican as it was back in 2000. To remain competitive in the county in the near future, Democrats will probably have to find a candidate with as much appeal to young voters as Obama.